This cat playpen wire cage house folds down easily for convenient storage or travel. It has 4 rolling casters (2 lockable) for easy cleaning & maneuverability, a slide-out leak-proof plastic floor pan, and swing open front doors with dual-point door latches for the security of the pet/s inside. Rectangular Tubes constructed Main Frame for more steady.. Sturdy metal wire for a strong cat playpen structure. 2 wire front doors, resting benches and ladders. Click for Full Description. Safe, comfortable cat playpen / cat cage designed with your cat's instincts & lifestyle in mind. The ladders and hammock would make the cage more interesting. Two swing-open doors with secure door latches provide easy access to your cats and easy cleaning of the cats litter box. Introductions: The Cat Playpen folds down easily for convenient storage or travel, has 4 rolling casters (2 lockable) for easier cleaning & maneuverability, a slide-out leak-proof plastic floor pan and swing open front doors with dual-point door latches for the security of the kitten or cat inside. The space is roomy enough for large cats or small kittens with abundant areas to play whether it be on the plastic pan or jumping from one of three adjustable wire framed plastic resting shelves and benches. 2 Tier Cat Playpen House Cage. Safe, comfortable cat playpen / cat cage designed with your cat's instincts & lifestyle in mind. The cat cage is roomy enough for large cats or small kittens with abundant areas to play whether it be on the plastic pan or jumping up and down. See photos. Most boxes have been opened for inspection and photos. In the event that any clauses or phrases contained here within are ruled out by a judge, the law, a lawyer, jurors, and or any other entity all others remain in effect. 2 wheel stoppers also included to lock pet playpen in place. 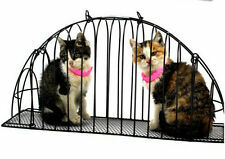 This cage for cats is made with heavy-gauge powder coated wire. Cat crates feature easy-to-clean molded perches and base. Six freewheeling casters and two stoppers are also included for easy transportation from room to room. The cat cage folds down easily for convenient storage or travel; and it has 4 rolling casters (2 lockable) for easier move. The simple cat playpen will be the paradise of your cats. The cat playpen is a safe comfortable room for your lovely cats on the basis of cat’s instincts and lifestyle in mind. This playpen has all the accessories' you're looking for! easy to use swing doors and roll & lock casters. Large Door Openings Provide Easy Access to Cat & Litter box. Roll & Lock Casters. We will be sure you are taken care of quickly. The Cat Playpen / cat cage (model 130) by is designed with not only your cat's heath in mind, it also has many great new features that make the pet parent's life much easier as well. The cat playpen / cat cage folds down easily for convenient storage or travel, has 4 roll & lock casters for easier cleaning & maneuverability, a slide-out leak-proof plastic floor pan and swing open front doors with dual-point door latches for the security of the kitten or cat inside. We also designed our cat playpen to make maintenance & access easy for the pet parent. Each cat pen features two large cabinet style front doors (top & bottom) w/ secure door latches allowing easy access to your cat & maintenance of the cat's litter box (if used inside the cat cage). The simple cat playpen will be the paradise of your cats. The cat playpen is a safe comfortable room for your lovely cats on the basis of cats instincts and lifestyle in mind. Safe comfortable cat playpen / cat cage designed with your cat's instincts & lifestyle in mind. It's designed to encourage safe, secure and comfortable travel for you and your pets. The wire door is designed to open on the front to allow easy entry/exit for your pet. We go above and beyond to ensure you receive the best level of service. Cat Playpen / Cat Cage Includes 3 Adjustable Resting Platforms, Removable Pan Weight 40 lbs,wire Gauge 3, 5, 9, 12 ga. Wire Spacing-1 x 5½ inchesSafe, comfortable cat playpen / cat cage designed with your cat's instincts lifestyle in mind. Assembled cat playpen measures 36L x 23.5W x 50.50H InchesCat cage includes an easy to remove leak-proof ABS plastic pan, 3 adjustable cat resting benches, 1 cat bed 4 wheel casters for easy maneuvering positioningLarge swing-open front doors (top bottom) with secure door latches provide easy access to your cat and easy cleaning of the cats litter boxCat playpen is designed to fully collapse for convenient storage portabilityCat playpen / cat cage made with strong metal wire with black E-coat finish to prevent rust. Cat playpen includes a 1 Year Manufacturer. The simple cat playpen will be the paradise of your cats. The cat playpen is a safe comfortable room for your lovely cats, on the basis of cat’s instincts and lifestyle in mind. Safe, comfortable cat playpen / cat cage designed with your cat's instincts & lifestyle in mind. This lower price does not reflect the total price you paid or the market value of the product and may not apply to countries with different tariff rules. With prolonged use of this cage, you may be able to bathe your pet without the cage and without bites and scratches. 1 piece Cat Shower Cage. - Convenient for you to pick up the cage with plastic handle. dog cage pet cage wire cage cat cage folded cage different size,blue. Product Type Playpen. Primary Material Details Fir wood. Location Indoor / Outdoor Use. Closure Type Latch. Primary Material Solid Wood. Shelf 17" H x 36" W x 32" D. Shelf Included Yes. Weather Resistant Yes. Closure Type Latch. Product Type Cat house. Location Indoor / Outdoor Use. Weather Resistant Yes. Shelf Height - Top to Bottom - Top 45". Storage Bag Included No. Shelf Height - Top to Bottom - Second 35". Product Type Playpen. Pieces Included Cage, 3 shelves, wheels and pan. Number of shelves 3. Portable Yes. Cat Size Large. Wheels Included Yes. Storage Bag Included No. Overall Product Weight 45 lb. Designed with a perch inside this 2-level cat playpen provides ample space for your feline pal to climb about and relax with 2 large openings for easy access. Made of powder-coated steel wire this indoor pet cage is built tough and features 7 wheels on the bottom making it convenient to move around. Large Indoor Cat Cage w Wheels 3-Level Kitten Playpen Steel Wire Pet Shelter 70"
Designed with a perch inside this 3-level pet playpen provides ample space for your feline pal to climb about and relax with 2 large openings for easy access. Made of powder-coated steel wire this large cat cage is built tough and features 7 wheels on the bottom making it convenient to move around. Closure Type Latch. Location Indoor Use Only. Product Type Cat cage/Crate. Primary Material Details Stainless steel. Storage Bag Included No. 7DDDC5E9876641458CF1A40E3E05D412 Size: 3 Tier; Finish: Silver. The cat playpen / cat cage folds down easily for convenient storage or travel, has 4 roll & lock casters for easier cleaning & maneuverability, a slide-out leak-proof plastic floor pan and swing open front doors with dual-point door latches for the security of the kitten or cat inside.